Wednesday, Aug 1, 2018-According to the Los Angeles Times, “the LAPD received a call from the man who allegedly took a pickaxe to the president’s spot on the strip in Los Angeles”. Reports claim the suspect arrived with a guitar case before taking out the implement to destroy the star. While he had fled the scene by the time officers arrived, he has since turned himself in and remains in police custody. A source claimed he would probably be charged with felony vandalism. It’s not the first time the star has been the target of an attack, with multiple incidents of vandalism. In 2016, James Lambert Otis, 53, was recorded using a jackhammer and a pickaxe to remove Trump’s name. He said he was motivated by the infamous Access Hollywood video in which the future president used lewd terminology to describe infidelity. Otis was sentenced to three years’ probation, 20 days of community service and paid $4,400 for the damage. The strip in Hollywood features multiple stars dedicated to celebrities, with 2018 honorees including Jeff Goldblum, Jack Black, Kirsten Dunst and Zoe Saldana. Recipients are selected by a committee that considers applications throughout the year and stars are purchased for $30,000. 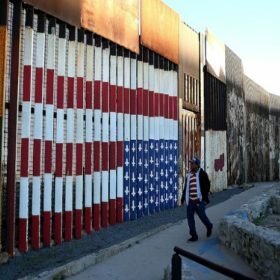 The star has also been the subject of protest art, with a wall erected around it in 2016 to symbolize the president’s policy on immigration.